Sometimes I watch silently as my officers sit in roll call; they listen attentively as the Sergeant goes over new policies and passes out the hot sheet. They discuss officer safety issues and critique the way a call was handled the day before. They rib each other a bit, laugh a lot, maybe they complain a little…and that’s OK. That’s the way cops are….they have a lot to talk about! Then they rise and carry their gear out to the marked cruiser. They search the back seat for any weapons or contraband that may have been hidden by prisoners; they test the flashers and siren, and check the shotgun. They sign on the computer, some say a little prayer, and now they are ready to go out and face the everyday challenges of being a Lorain Police Officer…to protect and serve! For over 45 years I’ve watched this daily ritual… the veterans who’ve seen it all, the young rookies anxious to save the world…..different faces and personalities for sure…but the same commitment to the badge and everything that it stands for. It still gives me goosebumps in a way that only a cop can understand. I’m still in awe of everything that they do, day in and day out. Maybe it’s the uniform that hasn’t changed much the last fifty years. It may be the feeling sometimes that we’re doing “God’s work.” Maybe it’s the war stories or the incredible courage and compassion that I have seen with my own eyes. It just may be the mystique of the “street cop” and the danger willingly faced by these heroes every day; or maybe it’s the infectious gallow humor that helps them cope with the daily dose of violence and pain. Not a whole lot different than I saw in Vietnam in 1968. Law Enforcement is a noble and honorable calling. Lorain Police Officers, and the dedicated staff that supports them, are quality people who, often at great risk to themselves, provide a valuable service to this community. They deserve your gratitude and support. When you come in contact with them, please take the time to recognize the humanity behind the badge. My wish is that next time you see a police officer, you will not look at the uniform, but that you will look at his/her face. And in that face I am hoping that you will see you; they are just like you. They want to make a living and they want to make a difference. They love their families, especially their children, and they want to go home to them at the end of their watch. They go to church on Sunday and they coach their kids…and your kids, too. They are grateful for their blessings, understanding that not all share in those blessings. They want to serve and they want to be part of the community. They want to learn and they want to be better. At the same time we acknowledge our connectivity and our shared reliance with those we serve. First and foremost, we recognize and accept the sanctity of life…everyone’s life. We are determined that every neighborhood and every person in the City of Lorain will know that we value them and that we are not only enforcers of the law, but that we are here to serve them and protect them. It is my view that we can only come to understanding through frequent, open, civil and honest discussions. Crime is a community problem, not just a police concern. Not unlike police departments nationwide, the LPD is going through a transition period. As we cope with the rapid social, economical, and technological changes in our society, we’re adapting and expanding our mission so as to provide the best possible service for our citizens….. you deserve no less! Our goal is to merge community and traditional policing to blend them into a policing model for the future. This model of policing will maintain the finest attributes of traditional policing and at the same time advance the philosophy of collaborative partnerships, geographic accountability, and continue the problem solving strategies that our officers have implemented in the last couple of years. We ask that you join us in our efforts so that together we can make Lorain a safer place to live. 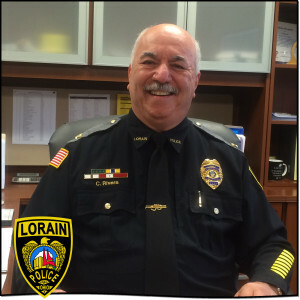 The purpose of this website is to provide our citizens with some insight into the operations of the Lorain Police Department and information that we hope you will find helpful regarding the services that we offer. I would like to acknowledge the outstanding effort put forth by Detective Orlando Colon and Administrative Manager Kathy Keiffer in coordinating the update of this website. Please enjoy your visit on the site and take time to share your thoughts, criticisms, or suggestions by e-mailing us or calling (440) 204-2103. We will continually strive to update and improve the site so as to better serve the community of Lorain. Thank you for supporting the men and women of the Lorain Police Department.